my take: What looks like wealth and upper class in America? What would bring an upper-middle class family shame? 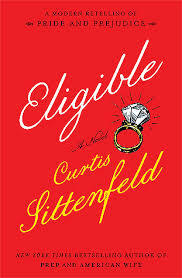 Curtis Sittenfeld has done a marvelous job translating 19th century Pride and Prejudice mores into the 21st century. In fact, she interpreted the old-maidenness and bad manners so well it helped me understand the original better. Mix the five Bennett girls with reality television, transgender discrimination, artificial insemination, feminism, CrossFit, yoga, and a decrepit Tudor ... throw in a couple eligible bachelors ... and add a misinterpreted text, the lure of fame, an act of racism at Stanford ... and violá! The current trappings that make P&P relevant and new. The new comes with a bit more overt feminist language ... in this tale of marrying off the Bennett women, Ms. Sittenfeld suggests a defense of pairing off. As Liz interviews an aging feminist for the magazine Mascara, the grand dame says, "'There's a belief that to take care of someone else, or to let someone else take care of you--that both are inherently unfeminist. I don't agree. There's no shame in devoting yourself to another person, as long as he devotes himself to you in return.'" And maybe that's what we've always loved about Mr. Darcy: he does devote himself to Elizabeth. The author points out that there's also no shame in remaining single. She gives Mary the last word/chapter. It's not about marriage or procreating ... it's about being who you are. She loves to be alone. End of story. Is it terrible to say I'd love to watch this as a mini-series? Sigh. I never tire of P&P. my source: Recommended and loaned (in hardcover, no less) by Daughter Anne. She lived in Cincinnati for five years and especially enjoyed all the references. Ooh, glad to know that was my copy as I think it deserves a place on my shelves... A fun read, but then the Cincinnati connections really made it for me!